Companies across Europe are realising the benefits of high quality automatic grinding machines, says P. S. Auto Grinding Ltd, which has witnessed an excellent level of sales during the first quarter of 2017. Recent orders in France, Germany, Italy and Norway have strengthened P. S. Auto Grinding’s position as the leading supplier of automatic grinding equipment in Europe. The company has held this accolade for some years thanks to its expertise and long-standing commitment to providing the highest quality machines and an after sales support network borne out of many years of experience in the market. Based in Scotland in the UK, PSAG is the sole distributor in Europe for the Japanese-manufactured Koyama machines, which have proven their worth in foundries throughout the world. In France, La Fonte Ardennaise group recently further committed to the benefits of consistency and health and safety issues associated with automatic grinding by purchasing more Koyama automatic grinding machines from PSAG for each of the foundries in the group. The ISO TS16949 and ISO 14001 iron casting foundries in the group range in capabilities from castings of a few hundred grams to 40kg and having previously used a range of automatic grinding solutions LFA has chosen PSAG as their automatic grinding technology partner. 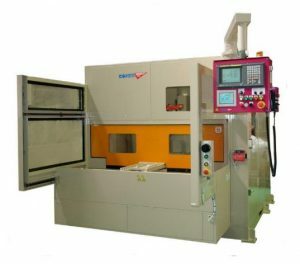 This is due to the reliability of the machines and the fact that they do not require experienced CNC programmers. Italian iron metal caster Fonderie Palmieri S.p.a. places efficiency at the heart of its pledge to quality production. The company recently purchased several Koyama machines from PSAG to expand its automatic fettling facility and meet customer expectations. Furnes Jernstoperi A.S of Norway has already realised the potential of Koyama machines having previously bought one from PSAG. Suitably impressed with the capabilities and the difference the technology can make to employees and production, the company has now installed a second machine. Such is the demand for Koyama automatic grinding technology in Europe that PSAG launched a dedicated enterprise in Germany, P. S. Foundry Tech GmbH, in July last year. Our subsidiary in Germany, P. S. Foundry Tech, is exceeding our expectations with very significant interest and machine orders. helping hand in improving production capabilities and process efficiencies.